First Line: There's a superstition that says if the palm of your hand is itchy you'll soon be receiving money. In Seattle barista Jen Hamby's case, she wishes that were true, but truth is stranger than fiction. When her hand itches, it gets a mind of its own and insists on writing messages from beyond. Definitely not something you'd want everyone to know. Another thing that Jen would prefer remain quiet is the fact that the scruffy homeless man that she's been going out and feeding on her breaks is her father, who refuses to stay on his medications. But she's going to have to let more people in on at least one of her secrets. When her itchy hand tells her that her boyfriend is cheating, Jen dumps him, understandably upset to learn that he's been unfaithful with her own half sister. When her half sister is murdered, what evidence there is points to Jen's father. She knows that she's going to have to take matters into her own hands because who's going to believe that that crazy old man is innocent... or that her itchy hand will lead her to the truth? Wendy Roberts knows how to write a book that's difficult to define. 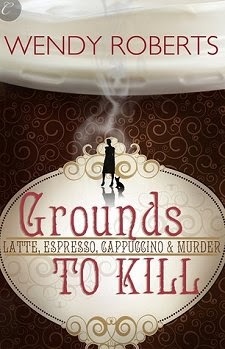 Grounds to Kill isn't the typical cozy even though there's a little romance, not much violence, and a dog. There's not enough of the paranormal in it to make readers' woo woo meters go off the scale. The book isn't noir because Roberts' sense of humor often comes shining through. I suppose I'll call this an edgy cozy and be done with it. As usual Roberts has created a likable main character who's so much like the rest of us with her intelligence, sassy mouth, and compassionate heart. I think what really sets this book apart from others that I've read is how Roberts shows what the presence of mental illness can do to a family. Despite everything they have done, Jen's father will not stay on his medications, and he has chosen to live on the streets. It's a heartbreaking situation for all parties concerned, which the author makes very clear. Jen's paranormal "gift" is also an interesting twist that leads to frustration and humor. Of course the hand never does anything as easy as spelling out JOE SCHMOE IS THE KILLER, and Jen is led on a merry chase in her efforts to decipher the messages and keep her loved ones safe-- even though I felt the killer's identity was a bit obvious. It's an element that Roberts does not overuse, which is a definite plus.